15/11/2011 Food & Beaujolais, More on the Fleurie and some tasting notes. Part 3 of the Beaujolais series. As Pauline, my guide from Back to Beaujolais, drove me around to get a better overview of Beaujolais, I managed to sneak in a few questions to her about the relationship between Beaujolais and food. According to her, it is a tradition to have Beaujolais with the food of the region which is pig meat. Dishes like saucisson au gene (Sausages with red wine cooked with the pressings of the grape), Andouilles(pig’s intestines) and other pork dishes go amazingly well with Beaujolais. Pauline recounted a conversation in which she had with a sommelier from a top restaurant in Beaujolais. According to the sommelier that has over 10 years of experience, he found it impossible to pair wine and food because there are too many perimeters that come with food. Every day, the same dish tastes different due to slight tweaks here and there. He found it better to pair wine with people. He would speak to the clients and try to understand their personality of if they were celebrating a certain occasion. From there, he would find a good bottle that would make them happy. I found this not impossible with Beaujolais wines. There are so many different faces to Beaujolais wines, from the easy-drinking Village wines to the complexity of the crus. Within the crus, you have 10 different personalities to choose from, which are perfect for different moods. For a fun-filled occasion, I could imagine a Saint-Amour or for a meal that required a more full-bodied wine, a Morgon. Beaujolais has so many different characters which is what makes these region so versatile when it comes to matching food with wine. Contrary to what people might initially guess, this cru of Beaujolais did not get its name from wines smelling like flowers. It was named after the roman legion that saved the people after the land. Fleurie is in the middle of the ten crus with the east having the river and the flat lands and the west having mountains. 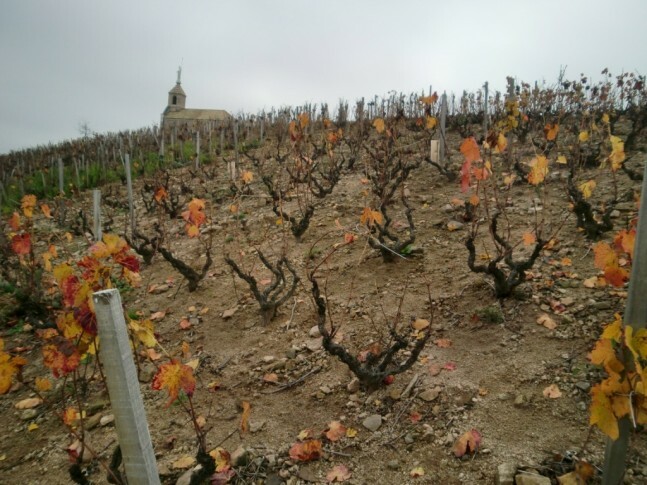 With the usual Beaujolais soil of sand and pink granite, it was fascinating to walk among the vines. 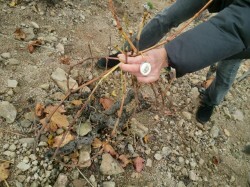 Pauline pointed out to be that usually during the winter, some vines retain their leaves longer than others. This is a sign of deeper and more solid roots. 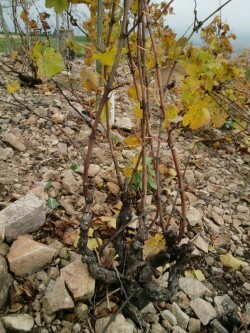 It is not hard to guess with vines that have not been sprayed with chemicals as chemicals do not encourage deep rooting. 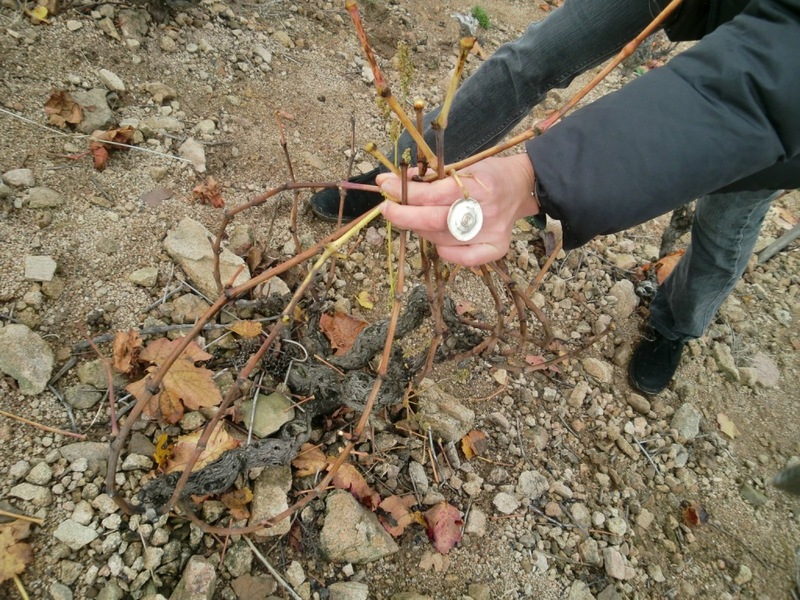 The quality of the grapes from different vines is apparent in dry years. 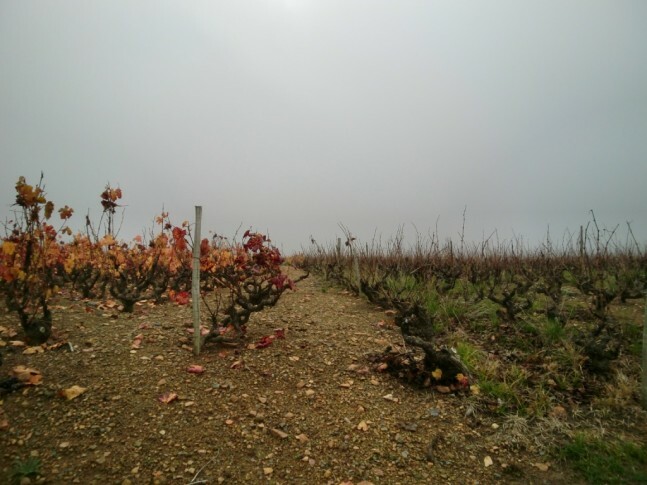 In the region, if green harvesting has to be done, this is a sign that the vines are over-stimulated with too much nutrients. We took a look at some of the plantings around us. I could imagine how hard it would be to do a vintage in Beaujolais, with the steep slopes and the rocky ground, one could easily roll down the hill and come out as a bloody mess. Pauline explained to me how important it was to have an empty mass in the middle of the goblet to alleviate disease pressure. 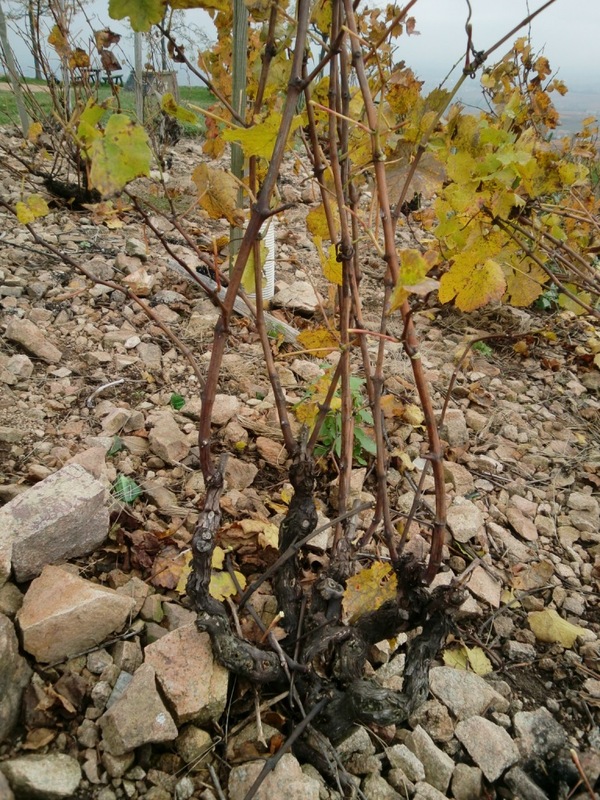 The shoots of the Gamay vine are flexible and easy to bend. When the grapes are ripe, it would be easy to harvest the grapes without the need of secateurs; plucking the bunches by hand would be sufficient. In years where the stems are too green, shorter maceration times are needed or they could even be de-stemmed for the carbonic maceration. Harvest usually takes place first at Chirouble, which climate is akin to a mini-valley and then the North does its harvest. During the winters, the air can be as cold as -5 degree Celsius in the North. Hail is also common here in the summer and can destroy parcels of grapes. 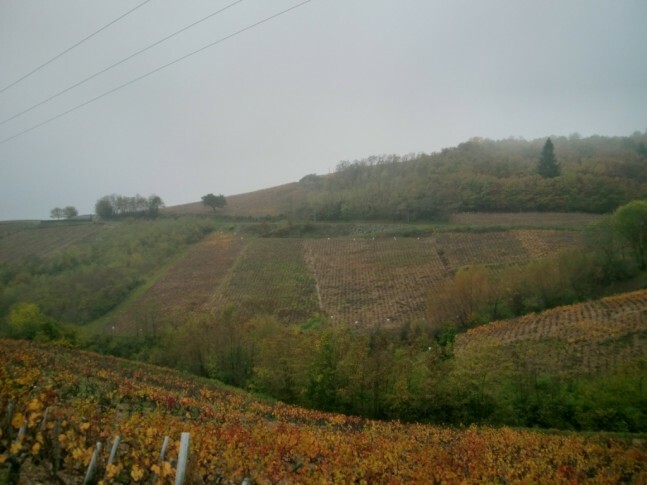 As we drove down the hills of Fleurie, Pauline mentioned about how the Interprofessional Beaujolais group and the French Chamber of Commerce are working together to characterise the terroir Beaujolais. A 10 year timeline has been drawn out, consisting of a group of winemakers, historians, climate experts and geologists to further define the terroir of Beaujolais. We could very well see in ten years a Premier and Grand cru system in place like that of Burgundy. How that will affect the image and prices of Beaujolais is anyone’s guess but it is comforting to know that the French themselves are already thinking their own region seriously. Semi-transparent purple. A nose of spice and med(+) intensity, lifted cherries and raspberries, light bubblegum. A beautiful fruit palate, slight vinous character with wood with a tad of flowers, short length and a heavy finish, a sort of leather and soy undertone by Carbonic Maceration. Med acid and Med tannins, slight hard and drying in the back. This has gone through 8 months in 25% old oak. Purple colour. A slight bubble gum life and a sort of estery aroma, med(+) intensity, strawberry, a rose-like, kirsch. On the palate, Med(+) acid, med tannins and a juicy berry flavour. Med(+) length and a light raspberry bubblegum fruit. Semi-transparent purple. Med(+) Intensity, bubblegum, fruit forward, redcurrants and raspberry, pinch, very expressive. On the palate, med(+) acid, flavours of granite, redcurrant, strawberry custard, a long length, a fruit bowl and carbonic finish in the back. Something minerally about it. Semi-opaque purple. Spicy, bubblegum, estery, med(+) intensity, full-blown, sweet fruit basket, forceful, cherries. Med(+) alcohol and acid, a med tannins structure, spicy, lots of redcurrants, med(+) length, light tea, delicious flavours gamey. Very surprised to find this open for 4 days and yet it is so drinkable. This wine changed my mind about the capability of storing Beaujolais after being opened. Semi-opaque purple. Spice, leather, cloves, plums, heavy nose with Carbonic smells, med(+) intensity. High tannins, slightly rough texture, raw but juicy, it needs more time in the bottle. Plums, med acid and med(+) alcohol levels, leather, dark plums and a long length. Purple colour. Bright nose with med(+) intensity, cherries and fresh peaches, dried fruit. A long length with lots of power on the finish. Flavours of plums, cherries, lollies, light pepper and a balance between fruit and earth, med(+) tannins, chalky texture, med acid levels and med(+) alcohol levels. Ruby colour. Aromas of roses, lolli, very expressive, fruit forward, med(+) intensity. On the palate, med(+) tannins, pluckery feeling, full of berries and spice-cinnamon, med(+) acid, a complex finish in the back like herbs, med(+) length, savoury finish. A lovely wine.